Gillis Seafood was established in 1946 by Donald B. Gillis in the seaside town of North Sydney, NS. Over the years, Gillis Seafood has expanded from one half ton truck and small garage, to a fleet of refrigerated delivery trucks and a modern, federally inspected (CFIA) distribution centre. They have built strong relationships with seafood processing companies throughout Eastern Canada and the United States and have created a strong supply chain to source a wide variety of the freshest seafood daily, to meet their customer ‘s needs. Jim Gillis, who worked alongside his father for 25 years, now leads the company. Third generation, Mike Gillis is also working in the family run business. 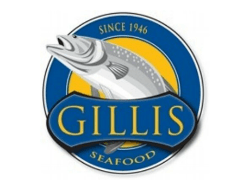 Gillis Seafood has built a reputation of supplying sustainable quality seafood products to hundreds of restaurants, grocery store chains and institutions throughout Eastern Canada. To further enhance food safety, they are certified to SQF 2000 standards under GFSI (Global Food Safety Initiative). From their plant to your business, their sales team would be happy to offer you a wide selection of fresh, frozen, salted, smoked and live seafood.